On February 22, hundreds gathered in the rotunda of the Jeong H. Kim Engineering Building to watch eight teams pick up a tennis ball and drop it into a bucket. 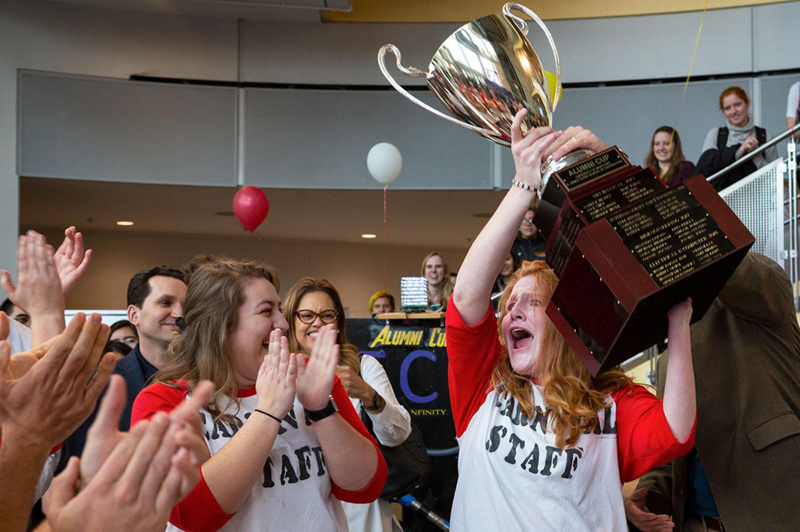 It may sound simple—but when it comes to the Clark School’s annual Alumni Cup competition, “simple” is rarely ever the answer. This year, the Department of Fire Protection Engineering prevailed as their carnival-themed machine not only completed the task with 22 steps in 90 seconds, but also entertained the audience with their fire and light display. This Barnum-inspired mechanism put on a show that earned them their first win, and a permanent place on the Alumni Cup winners list. Each year since 2012, the University of Maryland’s Engineering Alumni Network has celebrated National Engineering Week with the Alumni Cup, offering a chance for budding engineers to flex their creativity, ingenuity, and team spirit. Contestants receive the task a week in advance and must build a Rube Goldberg-inspired machine to complete it. (This year's challenge was “Having a Ball:” each team had to develop a machine that completed the task of picking up a tennis ball and placing the tennis ball into a five-gallon painter’s bucket.) The original designs are then judged on creativity, functionality, and team spirit. Alumni Cup fulfills the Engineering Alumni Network’s mission to connect current and future alumni by encouraging teamwork, dedication, and a healthy dose of Terp pride. The network invites spectators and faculty to watch as Clark School alumni judge each department’s design on four categories: machine functionality, oral presentations, drawing package, and team spirit. The top three teams this year excelled in the creativity of their designs and operated with the least human interference. This colorful carnival-themed machine was inspired by the The Greatest Showman. The machine had two nearly perfect runs, with little human interference in its 22 steps. This team honored Clark School eponym A. James Clark himself (’50, civil engineering) and the 125th anniversary of the Clark School. The construction site-themed machine took spectators through Clark’s educational life in 30 steps, complete with a display of him hitchhiking to school. This team and winners of last year’s Alumni Cup chose to go with DNA as their theme, as well as the various biological processes that go on in the body while you play sports. They placed again this year with a colorful reimagining of the human body, which completed the task in 22 steps.